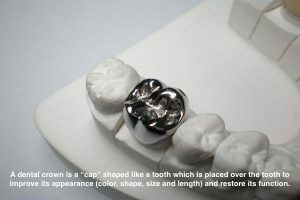 A dental crown is a “cap” shaped like a tooth which is placed over the tooth to improve its appearance (color, shape, size and length) and restore its function. This is one of the many restorative options to treat large dental cavities or severely damaged tooth and a tooth that cannot be treated with dental fillings. Dental crowns are also used to restore a tooth that has undergone a root canal therapy. Dental crown procedure normally takes two dental visits. During the first visit, a dental impression for a custom-fitted dental crown is taken and the tooth is prepared by dental drilling. The dental crown is cemented in place during the second dental visit. However, with the advancement in technology nowadays, you can wear your custom-fitted dental crown on your first dental visit. This advancement in dental crown technology is called CEREC same day crowns. Saves time – CEREC same day crowns are designed, manufactured and placed in position in just one dental visit. This dental technology saves the patient from the hassle of taking dental impression, the use of temporary dental crowns and most importantly from returning for a second dental visit. More durable – For longevity issues, CEREC same day crowns are long lasting and are as strong as those crowns made from gold material. Aesthetically pleasing – CEREC same day crowns can mimic the appearance of your natural teeth. If you are interested in this new type of dental technology, you can call your dentist and ask if it is available in his/her dental clinic. If not, you may want to ask him/her to refer you to a dentist who have one and practices this new technology.